EUR/USD has ticked higher in the Wednesday session. Currently, the pair is trading at 1.1320, down 0.06% on the day. On Thursday, eurozone industrial production declined 0.9%, below the estimate of -0.4%. In the U.S., the markets are expecting soft numbers from consumer inflation. CPI and Core CPI are forecast to post gains of 0.1% and 0.2%, respectively. On Thursday, the eurozone and Germany release GDP, and the U.S. publishes retail sales and PPI. Risk appetite has improved on Wednesday, although the euro hasn’t taken advantage against the U.S. dollar. There was positive news on two fronts which cheered investors. In the U.S., lawmakers have tentatively agreed on a proposal which will avert another government shutdown, which would take effect on Friday. However, the deal needs to be approved by Congress and President Trump. The agreement does not provide Trump will funding for a border wall, and the deadlock between Congress and Trump over this issue triggered a government shutdown in January which lasted 35 days. Both sides are eager to avoid blame for a second shutdown, and Trump hinted earlier in the week that he would go along with the deal, albeit with reservations. On the trade front, U.S. and Chinese officials are meeting for a third round of talks in Beijing. Investors have been frustrated by the lack of progress, but were relieved when Trump said that he could postpone a March 1 deadline for new tariffs on Chinese imports if the trade talks made sufficient progress. The U.S-China trade spat has rocked global equity markets and hurt global growth. 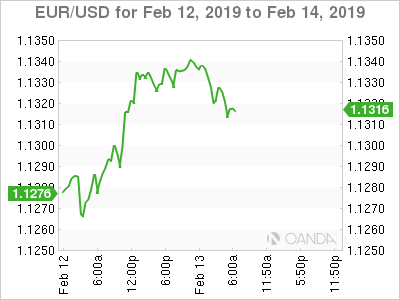 If the tariffs are suspended, EUR/USD is likely to move higher.